MTV's Musical Legacy: How 'Unplugged' Sold The Radio Star A new book from the original MTV VJs underscores how revolutionary spinning records on television wasn't. It's generally understood that something about MTV was revolutionary. Perhaps it was the music video, perhaps it was the short attention span, perhaps it was The Real World, but something about MTV had enough cultural permanency that it made for a fine oral history from Craig Marks and Rob Tannenbaum, called I Want My MTV, in late 2011. 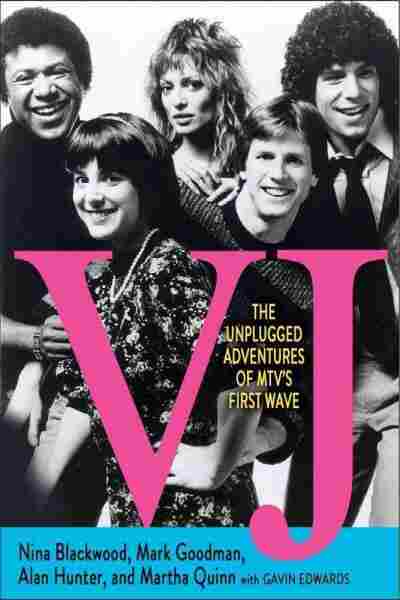 Now comes VJ: The Unplugged Adventures Of MTV's First Wave, written by surviving original hosts Martha Quinn, Mark Goodman, Nina Blackwood, and Alan Hunter. The last of the original five, J.J. Jackson, died in 2004. VJ memorializes the one part of MTV that turns out to have been the least interesting of all: the part where it was just like radio. Unfortunately, much of the book either feels bafflingly irrelevant (who cares what Nina Blackwood voted for or whether Martha Quinn got good grades, really?) or like a much too late attempt to wring scandal from the idea of hanging out with rock stars. They seem to be the last to know that "I did cocaine with David Lee Roth" is no longer a particularly juicy thing to say, and neither is "Steven Tyler hit on me once." We assume these things. We got it. But when they get to talking about MTV itself, their stories seem awfully small. Videos were rapidly growing in importance, after all. Bands were experimenting with styles and directors, people who looked terrible on camera were seeing it matter for the first time, and one bad video (the Marks/Tannenbaum book has a fantastic, dishy, uproarious chapter about Billy Squier's ill-conceived "Rock Me Tonite") could sink you. But what turned out to be entirely retro — what turned out to be more of a last gasp than a next wave — was the initial structuring of MTV like a radio station and the idea of the "VJ." Martha Quinn herself says that when she first heard about MTV, she didn't understand that videos would be part of it. She was envisioning a radio station being shown on TV and wondering what the VJs would do on camera while the songs were playing. In fact, aside from the fact that they were videos instead of records, nothing about the original MTV format was new, and the ability of television to disrupt the way people listened to music wound up being utterly dwarfed by the ability of personal computing to disrupt it. If you believed MTV was the future of music, you were looking over at this plugged-in box, and the future of music was over in that plugged-in box. It's hard to remember now, but at one time, MTV really was watched just like commercial radio was listened to: you would turn it on and see what came around, and if you particularly liked a video, you'd wait a while and hope you heard it. That's what half the slumber parties of my adolescence were about: waiting for Michael Jackson or Duran Duran. We don't wait very much anymore. It's not just that this model of MTV largely went away, or that getting most of your music listening through the radio faded. It's that the entire idea of ephemeral availability — that you would have to sit and wait for something to be played for you, and that at other times you had to do without it — is simply not how people expect to digest much of anything anymore. The VJs who believed they were at the beginning of the age of the music video were actually at the end of the age in which innovation in music would involve giving people new ways to wait for you to play the music they wanted to hear. The VJs were the part of MTV that was legacy media. There's a curious nostalgia around it now — "Why don't they play videos anymore?" — but the answer is painfully obvious: anything you want to see, you can find on YouTube in ten seconds. Commercial radio at least has the advantage of being well-suited to being on in the background at work or while you're in the car. MTV has neither of those advantages. Continuing to play videos like they did then would be a gamble on the viewer's patience and fondness for serendipity, both of which have taken a beating in the age of the MP3 player. And the VJs themselves were substantially more inessential than DJs were on radio, because on video, the artist and song information was on screen (foreshadowing iPods and phones that display song titles, really), so you didn't even need them to tell you ... anything. They did some interviewing, but even they admit in their own book that their interviews were of massively variable quality. Certainly, MTV advanced particular artists and styles of music that would have been much worse off in the 1980s without it. But if MTV contributed anything meaningful to music culture outside of particular bands or genres, it certainly wasn't the VJ and it probably wasn't even the music video, which already existed and would survive being largely abandoned by the network as it became a more important pioneer of reality television than music television. If the channel really contributed anything to the way we now think about popular music, it was probably MTV Unplugged. The series went on to provide the obvious benefits of calculated intimacy — Eric Clapton's painfully delicate "Tears In Heaven" — as well as some deservedly indelible performances like LL Cool J's "Mama Said Knock You Out" on the "Yo Unplugged!" special. But it would also spawn performances that either bestowed or underscored the credibility associated with serious musicianship for rock and pop artists like Nirvana and Mariah Carey. Instead of embracing the genuinely revolutionary idea that what Nirvana was already doing was adequately serious and important and artistic, MTV marketed the idea that you could tell they were good because they could perform on acoustic guitars wearing cardigans. Ironically, as rock and roll as it believed its aesthetic was, MTV wound up doubling down on the idea that quiet was genuine, folk was authentic, and the electric guitar was being used to sell schlock masquerading as music. Take the lights down, turn some of the amps off; that's when you learn what's what. Critic Sasha Frere-Jones has written that popular music is the only kind of art in which we obsess over whether artists are really what they say they are, and has pointed out that it's rather bizarre that we even care whether musicians are assuming a false persona when we don't care that actors are acting. MTV Unplugged has nevertheless fed the beast of keep-it-realness by egging on the idea that somehow, when Katy Perry does a jazz arrangement of "I Kissed A Girl," thus taking "I Kissed A Girl" completely out of the context of pop music, that's the way to tell whether she's any good or not. In the end, MTV pushed spectacle in music, but simultaneously created a market for an authenticity proving ground, which it then filled. Just as "Money For Nothing" could be both of MTV and suspicious of MTV, artists could combat their MTV images ... on MTV. That was the way in which the channel was revolutionary: for a brief cultural moment, it was both the disease and the cure – both supply and demand. The radio-station part, the part with the VJs, was the part that was always going to die. Not because MTV turned its back on videos, but because we turned our backs on generic interstitial blabbering as an accompaniment to curation, which we certainly still use. Now, we'll take a personalized stream from Pandora, or a playlist from Spotify, or a shuffle from an iPod, all with no hosting at all, or we'll seek out compelling, credible expertise. It's not enough to count on an unfulfilled longing to hear music — that is, the actual need to get one's hands on it — to make people tune in. The slumber parties that waited for Duran Duran videos in 1985 would just spend the night going down a YouTube rabbit hole now. What wasn't well understood at the time about the original video-spinning format of MTV was that with regard to music, it was much more a closing chapter than an opening one. These weren't the first big VJs; they were the last big DJs. What was hyped as potentially replacing radio was actually marking time until the iPod.